It is just one of those foods everyone loves. Kids, adults, vegans, carnivores, wealthy, poor. You can get it fresh, dried, or out of a can. It can be topped with ingredients of all colors and can be shaped into any form. You can stuff it, twirl it, slurp it, or layer it. And you can make it at home with as little as two ingredients. But why would you when you have so many great options out? That?s right. 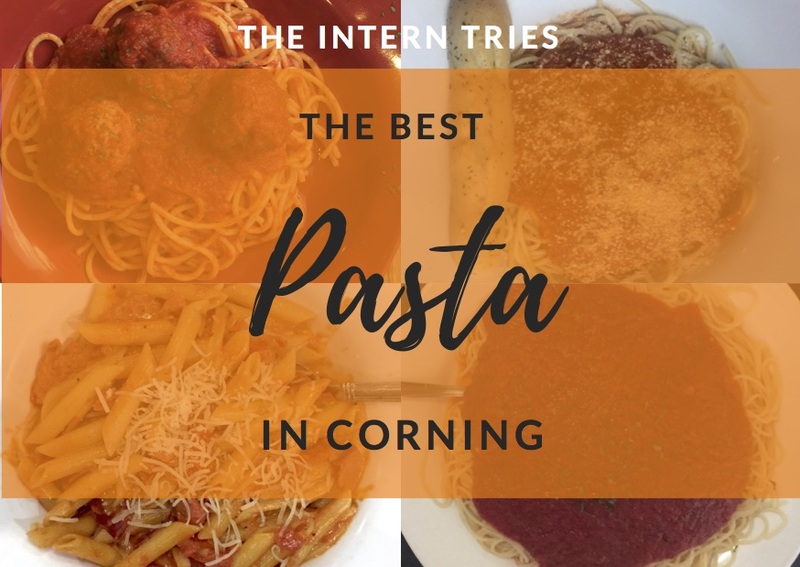 This week, I?m seriously carbo loading and trying four pasta dishes around Corning to find out which one tastes the best. When trying out these pastas, I looked for four things: flavor of the sauce, noodle quality, price and size. For the sauce, I want complexity, I want drama, I want it to taste like an old Italian Grandma spent eight hours cooking it in her tiny kitchen back in the home country. For the noodle, I want al dente, or for it to have a little bite, and I want to be able to taste the love put into the dish. For price and size, I want a good ratio and I want to leave the place ready to go into a carb coma.? Yes, yes I know. CMOG? and Pasta? Really? But in all fairness, when doing my research for this pasta extravaganza, I turned to TripAdvisor, searching for restaurants in Corning with Italian food. And CMOG came up as an option, so I had no choice but to include it. And I have to give them credit. This dish was the fastest pasta I tried. I walked in, grabbed a tray, went up to the pasta station, ordered, paid and sat down at a table all in less than three minutes. But then, it all goes downhill after. The pasta was alright, not great, not terrible, but easily forgotten. The sauce was sad. It was chunky and watery – the tomato puree was separated from the juice. It also lack a punch of flavor; all I could pick up was tomato, nothing else. It was also super messy, and the sterile white tables CMOG has do not help that. The one upside was the size. 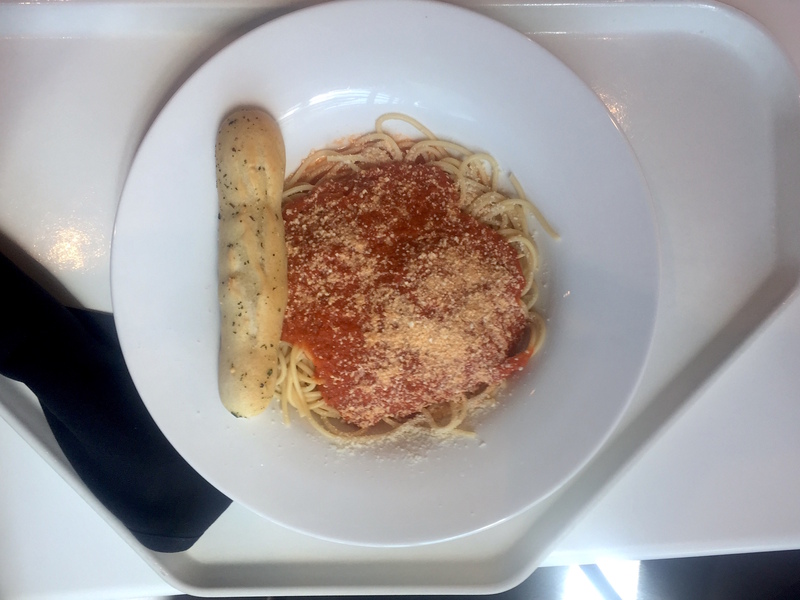 It was a large portion that came with a breadstick – which I used as a mop for the splattered tomato sauce. But while my stomach felt full, my taste buds were still longing for some umph: garlic, basil, oregano, literally another any flavor to compliment the straight tomato puree that made up the sauce. This dish stepped it up a bit with penne ala vodka. The only pasta dish Tony R?s offers for lunch, I was excited to try it. The sauce was creamy and chunky – sliced garlic, diced prosciutto, and crushed tomatoes. I love, love, LOVED the garlic. It was cooked enough to take the bite out of it, but not too much where its essence was lost. The sauce?s texture added so much flavor to it, and it had some heat that slid in at the end of a bite and faded back out nicely.. One thing I could?ve done without is the prosciutto. Sure, it may have added a heartiness to the sauce, but they slices were too big and it didn?t dance well with the rest of the dish – it clashed. 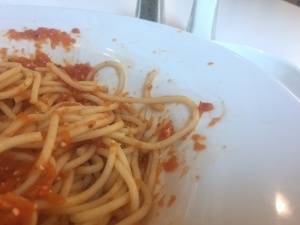 The pasta also was eh – ?a little overcooked and a little underwhelming.? 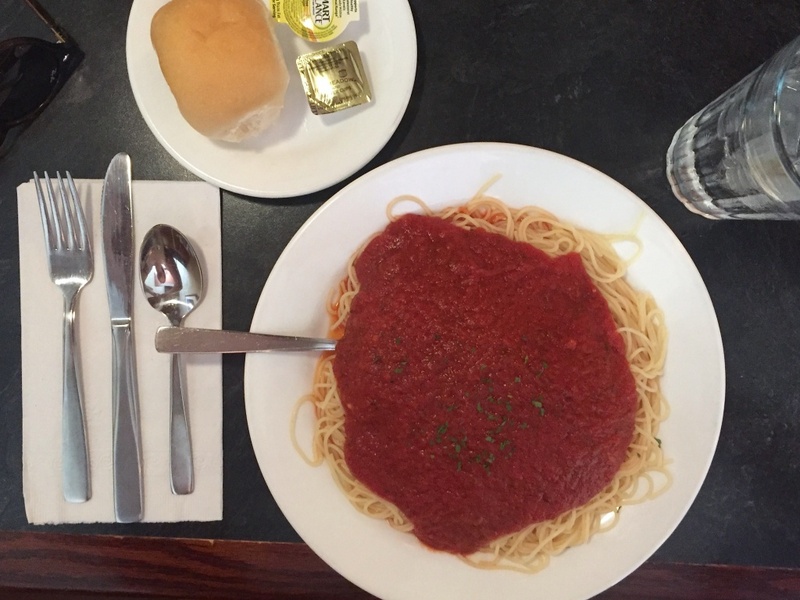 At Sorges, I went back to the classics with a simple spaghetti with tomato sauce. For a lunch size and the price, it was huge. I only ate half, and it filled me up. The dish itself looked like I googled a picture of spaghetti – it was near perfect. And then I tasted it. The sauce was loaded with intricate flavors – garlic, a myriad of spices, sweet tomato. And the color was beautifully dark and rich. Then I tried the pasta, and it was delicious – soft yet chewy and still had that nice bounce to it. The pasta is house-made, so it had to be good. The whole meal tasted as if Grandma Nonna was in the back serving it up to you until you are so stuffed you can?t eat anymore. 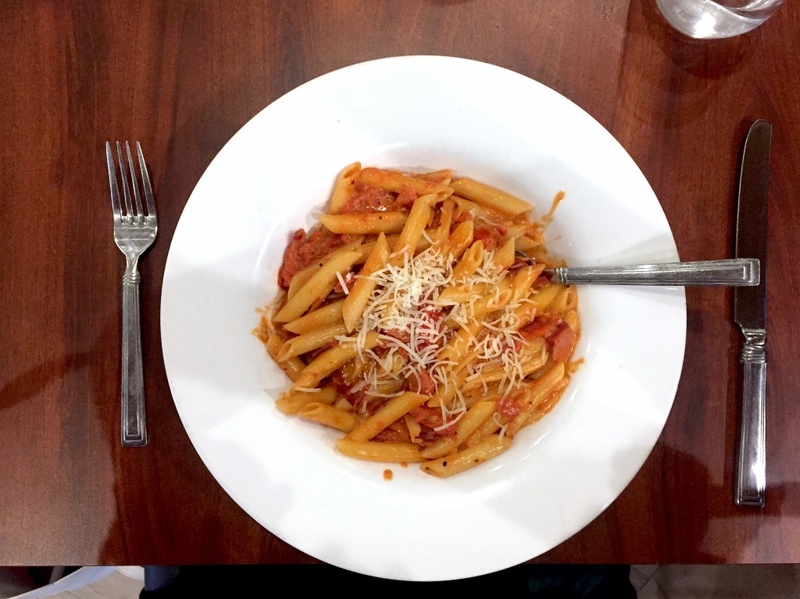 After, I was so tired and full – exactly the feeling I long to get when I eat pasta.? Cugini?s dish was the most aesthetically pleasing. 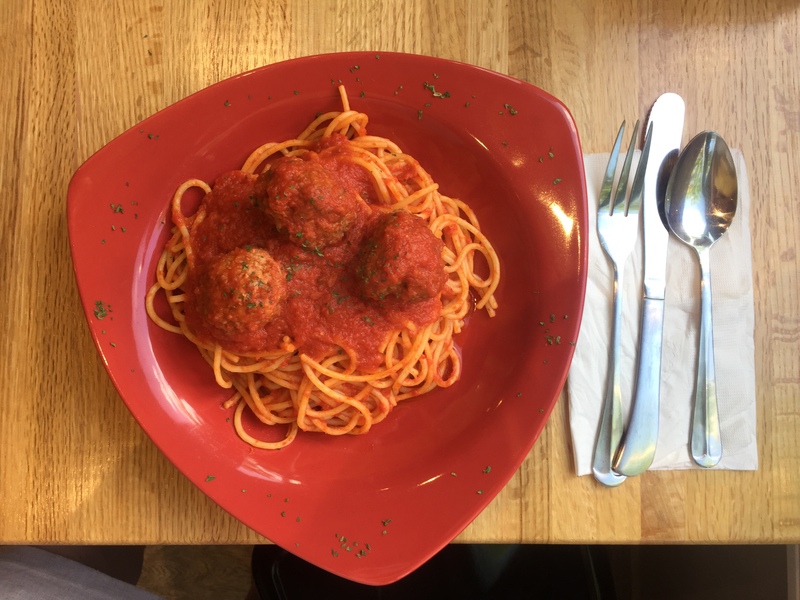 It came out on a red triangular dish that made the marinara sauce pop, and the three meatballs were artfully placed for symmetry. The sauce tasted as good as it looked. Light and sweet, bright and colorful, like any good classic marinara sauce. The spaghetti was alright. It didn?t blow me away, but I certainly wasn?t mad about it. But nothing better than a box of Barilla from Wegman?s. Where this plate really disappointed was the price. For the portion size to price ratio, it was too small, or too pricey, depending on how you look at it. And that alone turned me off to ordering it again. As stated in the title, it did come with meatballs, which I wasn?t a fan of, but I kept them out of the judging. Pasta is one of my most favorite dishes in the whole world. Its so easy and comforting and fulfilling. So when I go out for it, I’ll be heading to Sorge’s. Their sauce, with its complexity of flavors, homemade pasta infused with love, and generous portion sizes made me want to keep coming back for the delightful dish. While I go into hibernation from extreme carb overload, let?us know what your favorite spots are for pasta around town! Thank you for your honest opinion of our pasta and sauce! I was pleasantly surprised to see that you were delighted with our serving. You are welcome to come in any time for more of your winner dish!!! Thanks again!! How can you compare and rank these dishes by price? You have pasta WITH and WITHOUT meat. Do you think a dish with meat would be less expensive as one without it… or even the same price? It’s like comparing apples to oranges. Good luck in your future reviews.
? All CMoG food is terribly overpriced. They throw the pre-cooked macaroni in hot water, then into a small fry pan on a hot plate and marry it with “sauce” straight from a freshly opened can out back. The only edible bite of food is their paper thin tasteless pizza. What a joke.